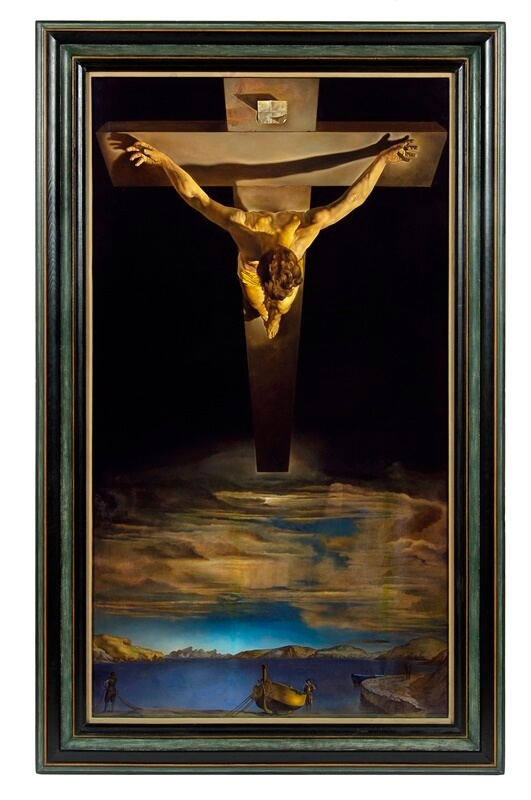 Weighing 70kg and measuring 205 cm × 116 cm, Salvador Dali’s Christ of St John of the Cross is an imposing painting that is a major draw for the 1.2m annual visitors to Kelvingrove Art Gallery and Museum. Painted in 1951 and purchased by the City of Glasgow in 1952 for £8,200, it is a depiction of Christ based on a drawing by the 16th-century Spanish friar John of the Cross. The current planned loan will see it feature in an exhibition titled Dalí/Duchamp, opening on October 7 at the Royal Academy, with the exhibition then travelling to The Dalí Museum in St Petersburg, Florida from February to May 2018. This will be the fifth time the work has gone on loan with previous visits to New York, 1965, Paris, 1980, London, 2000 and Atlanta, 2011. An image of Christ of St John of the Cross will remain in the space at Kelvingrove Museum and Art Gallery, alongside interpretation explaining why collections like Glasgow Museums lend objects. 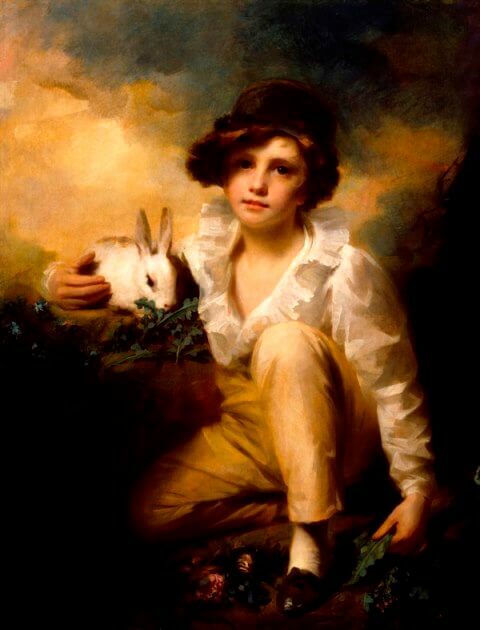 The Royal Academy’s Henry Raeburn’s Boy and Rabbit, will go on show at Kelvingrove Museum as part of a reciprocal loan agreement where it will hang in the portrait section of the Looking at Art gallery in Kelvingrove Museum from September 2017 until May 2018. Earlier this week Sophie Kostin, Frames Conservator at Glasgow Museums, delicately unframed the iconic Dali painting at Glasgow Museums Resource Centre before Suzanne Ross, Painting Conservator at Glasgow Museums, inspected the work in preparation for it being packed and transported to the Royal Academy. When a painting goes on loan and it is already on display the conservation team normally assess it in situ to get a rough idea of any work that may need to be carried out. Then they will bring it into the conservation studio at the Glasgow Museums Resource Centre to give it a more thorough assessment. “A lot of the time we are criticised for taking a painting off a lot earlier than it’s due to be on display at the borrowing venue but this is because there are many things that we have to do such as change the glazing for laminate, low reflective UV protected glass,” she says. Kostin says on many occasions the paintings will be protruding from the back of the frames and she has to build them up to make sure they are safe again. They will then use specialist packing cases, which have to be ordered and are fitted out to the specific painting. The painting of Christ of St John of The Cross has been restored quite dramatically twice in its short lifetime, which also needs careful checking. It was vandalised in 1961 when someone attacked it with a sharp stone. 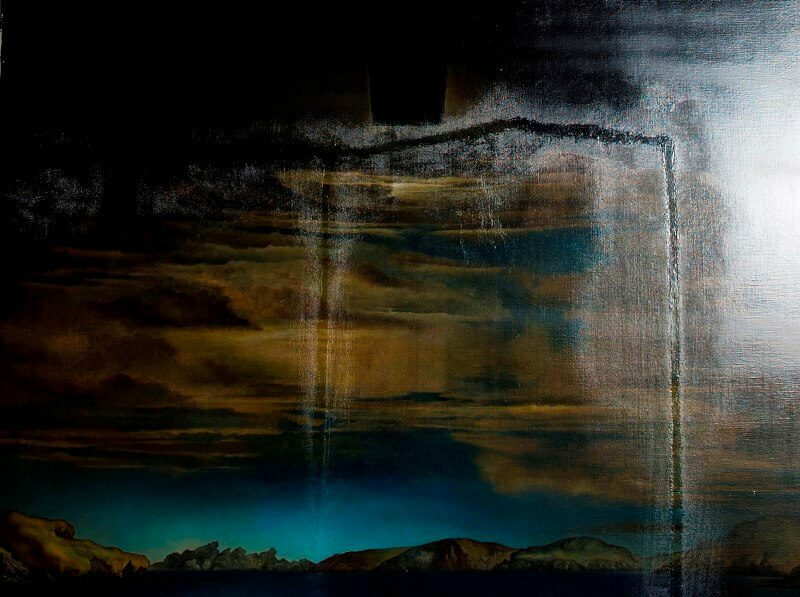 It was slashed once horizontally and twice vertically and a massive part of the canvas came flapping forward. It was originally restored following the attack and had a wax lining put on it. The last major conservation treatment, says Kostin, was in 1979 when the previous conservation (re-lining and tear repair using wax resin) was removed due to lining deforming around the tear. Christ of St John of The Cross was vandalised in 1961 when someone attacked it with a sharp stone. "The damage is only noticeable in a raking light." 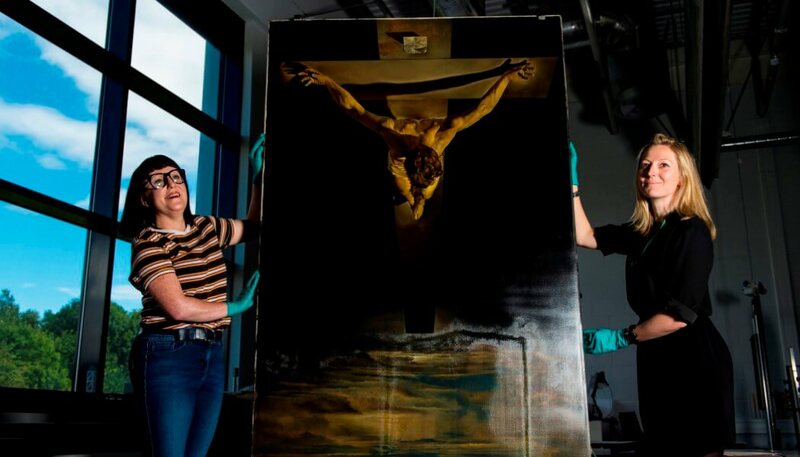 Christ of St John of the Cross was last on loan in 2011 when it featured in Salvador Dalí: The Late Work, an important exhibition focusing on Dalí’s later career at the High Museum of Art in Atlanta, USA so the conservation team were confident it was in relatively good condition. Kostin says the team is doing everything it can to protect works in transit and the cases they go in are fitted out with plastazote, which is inert, and they are bespoke fitted. They use companies that hire out specialized crates and they fit the inside of it with the exact specifications of the object. The painting will then be sent down to London next month with a set of fittings, including heavyweight L-brackets but Glasgow Museums are prepared to discuss different ones with the Royal Academy. As well as Dali’s painting the Glasgow Museums’ team are also busy with the £66m Burrell Renaissance project, which will see parts of the collection go on tour (the first of which happened last year and was the first in the collection’s history) while the museum is being redeveloped. They are about to send a group of Matthijs Mari paintings and drawings to the Rijksmuseum in Amsterdam, which will launch an exhibition in October on the Dutch artist. Many of the drawings needed conservation work as they were adhered to old acid mounts, so they were cockling and the conservators had to carefully remove them from their old mounts and gently flatten them out by putting them on a vacuum table. As well as this Kostin says a substantial amount of frames they discovered in the Burrell Collection had been separated from their works over the years. Some works were in modern frames and she believes that somewhere down the line it was thought to be too much work to conserve the old frames and instead they made new ones. 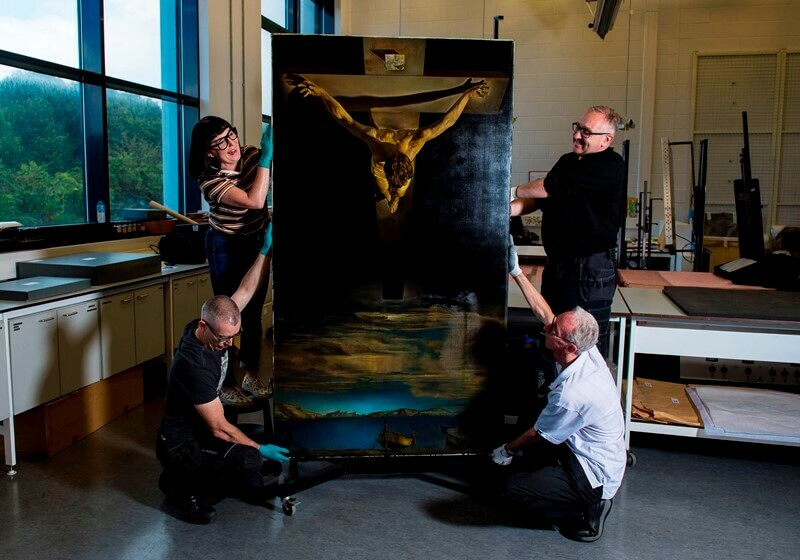 Salvador Dali’s Christ of St John of The Cross will return to Kelvingrove Museum in summer 2018 before travelling to County Durham for an exhibition at Auckland Castle in autumn 2019, where it will feature in the newly opened Spanish Gallery.